Because there are so many types of metal, and they all retain purposeful qualities, metal is a widely consumed and desired commodity. The infinite uses of metal causes their demand to increase, and their prices to rise and fall, and change on a regular basis. There are also principle reasons why the price of certain metals fluctuate from time to time. And now that scrap metal is a known valuable commodity, it too has experienced variations in worth and demand. Continue reading to learn what influences the prices of metal, and what metals are worth the most money in today’s economy. Some of the most vital and economy-changing commodities are made from ferrous and nonferrous metals; like ships, airplanes, spaceships, vehicles, and more. These commodities alone can make metal worth their current and past price tags. Even discarded and used metals are now widely sought-after and retain monetary value. Not only does this better protect our natural environments by reducing waste, it provides alternatives for those in need of metal at a lower price tag. One of the largest influences on the price of metal are companies and business, both domestic and international. Because scrap metal has become a significant source of revenue for many businesses all over the world, the prices for them have risen drastically in the past decade. It is a simple example of supply and demand. Another major influence on the price of scrap metal has to do with non-availability of certain metals, depletion of certain metals, labor costs, reduced overseas mining efforts, and more. 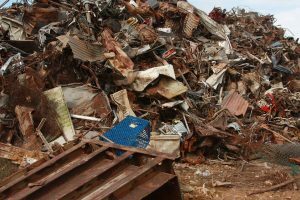 The scrap metal industry is growing at incredible speed because many metals, like aluminum, copper, and steel, can be recycled and reused over and over again. This allows many businesses to purchase good-quality metal products at a better price. It also reduces the need for over-mining across the globe. Metals like copper and iron are high in demand, and less available in today’s mining economy. This makes the prices of scrap iron and copper higher than before. The same applies for the scrap aluminum metal. In basis economics, the higher the demand, the bigger the price tag. Recycling scrap metal is extremely beneficial and important for our environment and our global economies. We can drastically reduce the need for mining when we simply recycle old metal items and pieces. Junk cars, automotive parts, old appliances, copper wiring, electronics, sheet metal, and more are all examples of commodities that retain significant sources of metal that we need. Consider recycling anything made from metal if you have no use for it any longer. You might even be able to make some fast cash by calling a local scrap metal recycling company! Call Zore’s Inc. at 317-247-8484 to sell your junk car for cash on the spot in Indianapolis. We offer the fairest and highest cash payouts for junk vehicles, appliances, construction equipment, machinery, and more! To get fast cash for junk cars in Indianapolis, just call Zore’s Inc. at 317-247-8484 and request a free quote today. This entry was posted in Metal Recycling and tagged Prices for scrap Metal, recycling scrap metal, scrap metal recycling company. Bookmark the permalink.